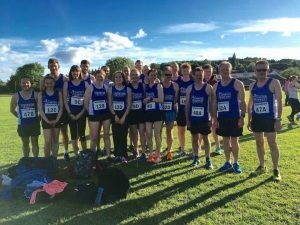 A great month of running (and swimming and cycling) from the Harriers during May including the fantastic team event that is the Run Exe Relays and of course, the Harriers own Bampton to Tiverton race. First up was the second fixture of the Run the Exe 5k Series. Harriers are attending this series instead of speed work on the first Tuesday of every month throughout summer. Full details on the next fixtures can be found here. The Crediton Crunch took place on Sunday 7th May. 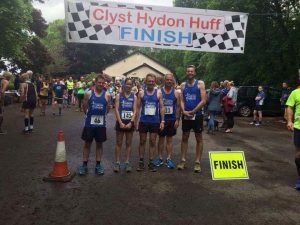 This is an undulating, multi-terrain 10k race in scenic mid-Devon and is part of the Instep Devon Championships. There were some great times from the Harriers and congratulations go to Mary Humphries for coming first in her category. We also had 5 Harriers taking part in the Taunton Dean Triathlon which took place at Wellington Sports Centre. All Harriers opted for the sprint race which consisted of a 400m swim, 22k bike and 5k run. Well done to Graham, Alan and Hannah and especially to Rose and Kerry on completing their first triathlons. 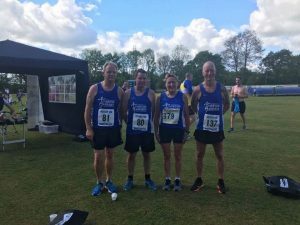 Sunday 14th May was a busy race day with The Ottery 10k, Bideford 10k and Exe Valley Triathlon all taking place and 13 Harriers in action overall. Serane Stone was the solo Harrier at the Bideford 10k and finished second lady and first F40 in 37.21. Great running from Serane. Congratulations to the men’s team who finished 4th overall. Walter Andrews raced in the novice event (200m swim, 18 km bike, 2.5 km run) and finished 6th overall and 1st in the M50-59 category. Walter completed the swim in 6.27, bike in 36.51 and run in 15.58 and a total time of 1.01.48. The evening of Friday 19th May saw some excellent results, fantastic team spirit and some enormous pizza’s being consumed afterwards! I am of course talking about what is hopefully becoming an annual Harrier’s outing to Exeter, the Run Exe Relays. Some really fantastic results and big improvements on last years performances (Richard and Tamsin both shaving 1min 18 secs off, Serane 51 seconds faster and Alan 45 seconds). A big thank you must go to Helen Kirby for managing to pull 6 teams together and organising us all which is no small task! Well done to all who ran and congratulations to Simon, Serane and Kerry. James Morrison took part in the Windermere Marathon. Many of you will be familiar with James’s fell running achievements but this time he was racing on the road. James finished in 3hr29:34 and 52nd position out of 648. This was 15 mins quicker than last year’s time for The same marathon, and also knocked 11 mins off his over all marathon PB. Great running from James. The Taunton Triathlon took place on Sunday 28th May. This consisted of a 400m (16 length) swim followed by a challenging bike course that took the athletes on a 28km reasonably flat route. The final challenge was a town centre based 5km run finishing a lap of the sports ground. Three Harriers made the trip to Taunton, both Len O’Connell and George Stone were 2nd in their categories, Len finishing in 1.34.31 and George in 1.32.07. Alan Ledger finished in 1.22.31 improving his time from 2015 and also finished 9th overall in the swim. Well done to the three of them. Also taking part in a triathlon, a little further afield was Richard Potter who completed the Swansea Triathlon on in 1.15.28 and finished in 193rd position. Well done to Richard. Fresh off the back of his marathon the week before, James Morrison ran the Helvellyn And The Dodds fell race (14.9miles; 4386ft ascent; category AL), finishing in 3hrs27:43 and 80th position. Well done to everyone who ran and was involved in the organisation of the race. A really fantastic month of racing which many achievements to be proud of. Finally, summer training is underway on Tuesday evenings on the High School 400m grass track. The once a month Thursday off road runs are also proving popular so watch out for June’s. Also, it has been great to see some new members joining over the last few months and we look forward to seeing them in Harrier’s vests and reporting on their race successes.